← RayJay’s Bar & Grill, Hayward WI – Great Place! Summer 2016 – this property has been sold. 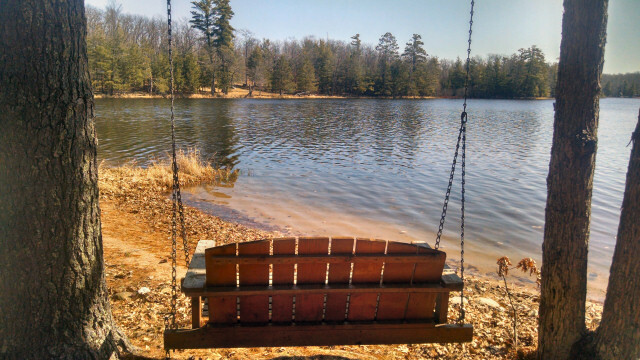 Contact me to help you find another beautiful lake property! 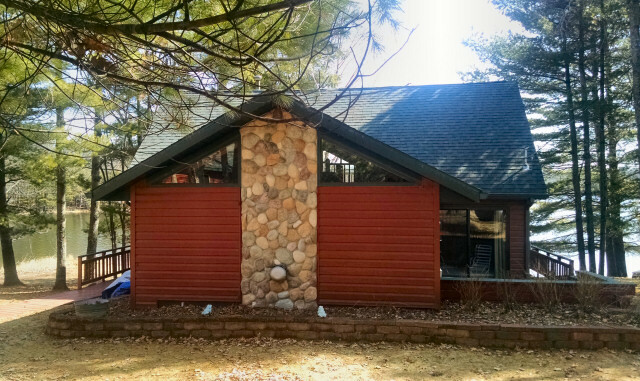 Come and look at this sparkling northwoods gem! 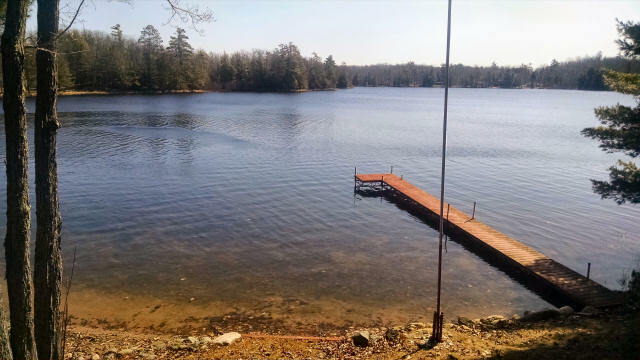 Stunning lake views and your own amazing sugar-sand beach only a few steps from your 12×40 lakeside deck! Northwoods paradise doesn’t get any better than this. 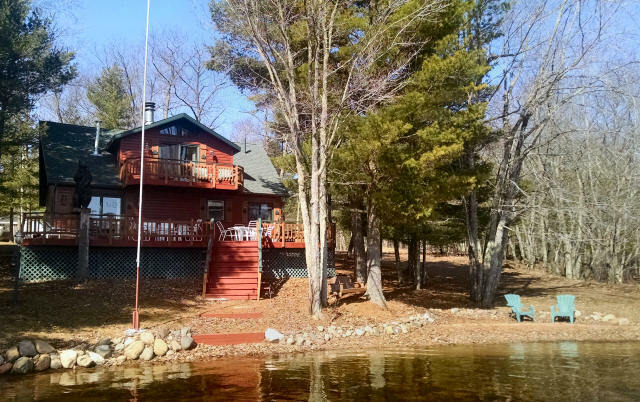 Recent renovations of this sun-kissed chalet offer you maintenance free enjoyment on a pristine northern Wisconsin lake, close to the desirable Eau Claire chain of lakes. Lake Beauregard is a seepage lake, just under 100 acres in size and about 20 feet deep. This moderately clear water lake offers something for everyone in your family; excellent swimming, boating, good fishing and a most enchanting wilderness skyline view. If you want your own private beach – this is truly the place for you. Here is a devine lakeshore setting with sugar sand as far as you can see into the lake. So many places to enjoy this view from; your huge deck off the cabin, the loft deck, plus the many seating areas along the shoreline of your yard. 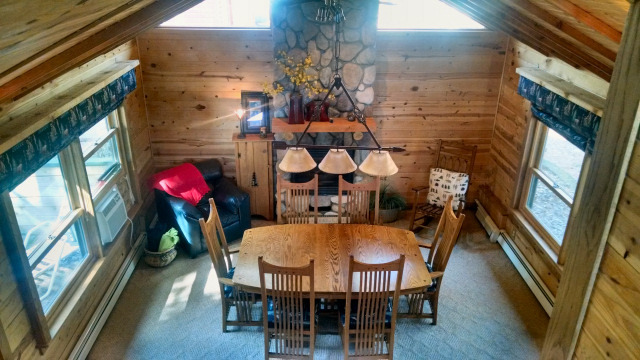 The cabin inside boasts beautiful wood walls and ceilings, with a vaulted great room and loft. The side entry leads you into a kitchen bathed in sunlight. The ash wood kitchen floor compliments the cabinets and counters well and I love the lakeside counter seating area-perfect for enjoying that morning cup of coffee while gazing over the lake. Beyond the kitchen you’ll find a spacious living area with a wood-burning fireplace and plenty of bright windows. Off the back of this room is a bedroom with full-wall glass patio doors leading to a quaint outdoor brick patio. The owners added a stackable washer and dryer set to part of the closet in this room. If one didn’t need the sleeping space, this room could make a nice office or library. Across from the livingroom and behind the kitchen area is the bathroom and another bedroom. The bath, although small, is nicely remodeled and has a corner shower, modern pedestal sink and cute up-north accents. The bedroom has unique siding on the walls and fits two twin beds easily. As you walk through the wide hall to the rear of the main level, you’ll notice all the built-in storage areas; each with unique lighting and well-thought out shelving ideas. The pretty great room at the south end of the main level will take your breath away at first. The beautiful vaulted ceiling, impressive stone fireplace, and extraordinary lighting really makes this room glow with northwoods ambiance. Currently the sellers use this room for dining, but one could easily make this into a cozy living area if desired. The sunlight from the loft greets you as you ascend the wood stairway. What a beautiful and spacious room. A wall of lakeside windows with patio doors that lead to a large deck. 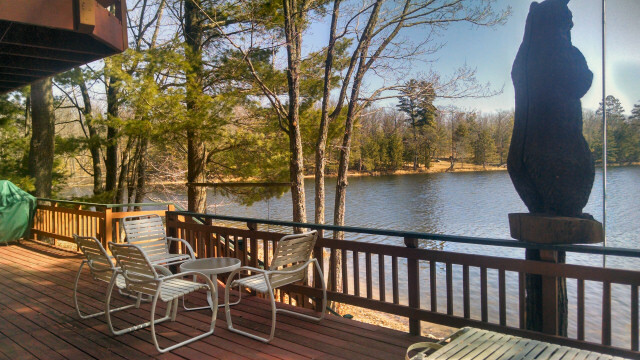 Imagine….standing on this deck late a night, looking over a moonlit serene lake. True bliss is all I can say. Walk past the gas fireplace and open the rustic door which leads to a small room off the loft – perfect for a walk in closet, extra sleeping, or for an office. Across the room, and through another rustic door, you’ll find a large walk in closet roughed in – plumbing for a half-bath is already here so you can easily turn this into another bath or a bath/closet combo. This property has several outbuildings, and as I left the cabin towards them, I noticed the massive stone waterfall. 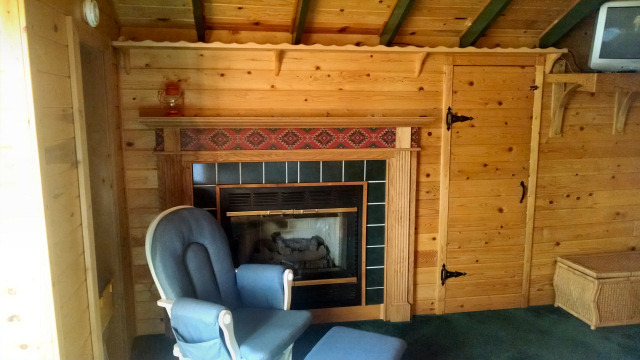 The owners tell me it is a very unique piece, brought up from another state just for this home, and they thoroughly enjoy the sound of the running water from within the cabin. There is a large 24×40 garage that houses two vehicles, a workshop, and wood-fired sauna and even a privy! Next to the garage is the bunk house for overflow sleeping, a fire pit with a lake view, and beyond that is a storage shed for all your summer boating toys! 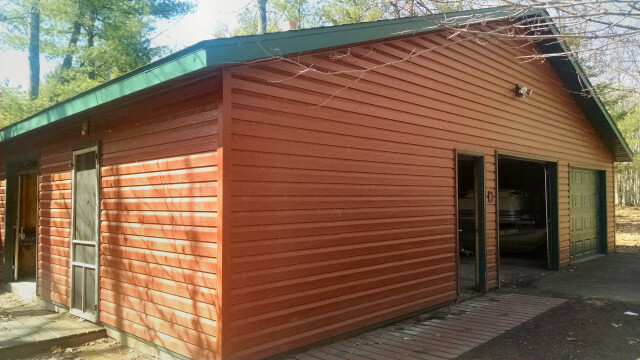 All buildings have matching steel siding, newer roofs (garage new in 2014), and are maintenance free. 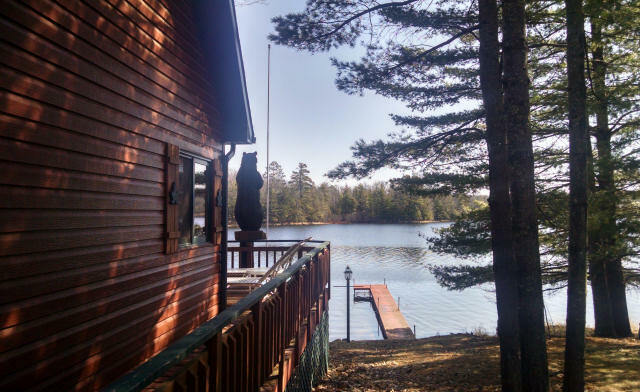 This 4-season cabin has been well maintained and has a drilled well, updated septic and has LP-fired hot water heat in addition to the 3 fireplaces! This entry was posted in Cabins For Sale Hayward, Chalets For Sale Hayward, FEATURED PROPERTIES, waterfront cabins, waterfront chalets and tagged 11602 beauregard lake rd, area north realty inc, beauregard lake douglas co wi, cathy lareau real estate agent, chalet for sale near solon springs wi, chalet for sale on small lake northern wi, chalet with swimming beach in hayward wi, lakefront chalet for sale hayward wi, newer lake chalet for sale in northern wi, waterfront chalet for sale near hayward wi. Bookmark the permalink.